The RK6A is an "ultra-short" knob that is adjustable between a high and low position. 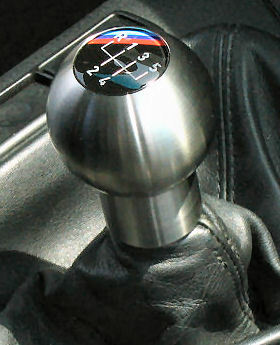 The RK6A knob is available either with the standard black BMW-style insert (5-speed or 6-speed) or with a genuine BMW Motorsport tri-color stripe insert (5-speed only) at an additional cost. Knob and e-brake available only in stainless steel. Heavy! Love it and the added feel of control! From Anonymous of Atlanta, Georgia on 8/2/2012 .